In July 2002 a British subsidiary of the Norwegian construction company, Veidekke, admitted having made a payment of US $10,000 to a senior Ugandan civil servant in 1999. Richard Kaijuka, at the time Uganda’s energy minister, acknowledged receiving the payment, but maintained it was not a bribe. After the payment Veidekke became a member of the construction consortium chosen for the Bujagali hydropower project, following a procurement decision that was not based on full international competitive bidding. When allegations of bribery surfaced the World Bank suspended its financial backing, and the project became the subject of anti-corruption investigations by the World Bank and four different governments.2 At the time of writing, the Bujagali dam project is still stalled. The cumulative environmental impacts of Bujagali and other dams on the Nile have never been assessed. Environmental experts argue that the Jatigede dam is not needed. Rehabilitating deforested lands and reviving the region’s silted rivers would do more to prevent floods and droughts. ‘Reforestation should become the first priority for maintaining the water catchment area, without which there would not be enough water to fill up the reservoir’, says Usep Setiawan of the Working Group on Conservation for Nature and Natural Resources. Supardiyono Sobirin of the Sunda Forestry and Environment Expert Board agrees. ‘The main difficulty of reservoirs in West Java is the water supply because river flow areas have been damaged and cannot provide water to the reservoirs’, he said. 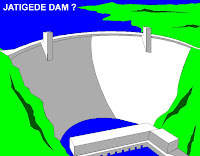 ‘Why would they build more reservoirs if there is no water?’ The plan to build the Jatigede dam rather than promote more sustainable alternatives may be part of a wider pattern of distortion in Indonesia’s development planning process. In August 1997 staff members of the World Bank’s Jakarta office prepared a confidential report on corruption in development projects in the country. The leaked report found that: Most GOI [Government of Indonesia] agencies have sophisticated informal systems for diversion of 10–20 per cent of the development budget under their management, and for utilising the proceeds diverted to supplement their inadequate operations funds and their compensation. These arrangements vary widely among GOI agencies, but almost universally depend on the payment of percentage or lump sum rebates or ‘kick-backs’ by contractors implementing projects from the agency development budget. Such payments are informal but regarded as an overhead or informal ‘tax’ by most firms doing business with GOI, and are typically included in the unit prices or bills of quantity for the contract.4 ‘In aggregate’, the report estimates that ‘at least 20–30 per cent of GOI development funds are diverted through informal payments to GOI staff and politicians’. All payments identified by the report are linked to decisions favouring new investment projects. The document mentions numerous cases in which 50–80 per cent of the funds budgeted for land acquisition and resettlement assistance were diverted. This is hardly an incentive for minimising resettlement. Communities affected by projects like the Jatigede dam pay the price for the diversion of development funds. Society at large and the environment also suffer indirectly from a decision-making process that is fraudulently skewed towards approving new investment projects even when other options – for example, reforestation or sustainable water management programmes – are more appropriate. Corruption in the development planning process is not an isolated phenomenon, nor is it confined to Indonesia. The Bataan nuclear power plant is the Philippines’ largest investment project and cost more than US $2 billion. Westinghouse was controversially awarded the main contract after the late Filipino dictator, Ferdinand Marcos, personally overturned the initial contract decision.5 Westinghouse admitted paying US $17 million in commissions to a friend of Marcos, though it maintained that the payments were not a bribe. The reactor sits on an active fault line that is part of the Pacific’s ‘rim of fire’, creating a major risk of nuclear contamination if the power plant ever becomes operational. Completed in the 1980s, the plant has never produced a single unit of electricity. Enron’s Dabhol power plant threatens to destroy a fragile coastal area in India. A representative of Enron admitted that the company paid US $20 million ‘on [the] education and project development process alone, not including any project costs’.7 The multi-billion dollar plant was mothballed in 2001 because its electricity was prohibitively expensive. The reservoir of the Bakun dam in Sarawak, Malaysia, will submerge 700 km2 of tropical rain forest. The mandate to develop the project went to a timber contractor and friend of Sarawak’s governor. The contractor had never developed a power project before and lost the contract after a few years, but he managed to log the project area during this period. The provincial government of Sarawak is still looking for customers to consume the power to be generated by the project. The list goes on. None of the projects mentioned above make any economic sense. They had serious environmental and social impacts, and should never have gone forward in the first place. Corruption and cronyism have environmental and social impacts that go far beyond the individual projects tainted by bribery. They skew the planning and decision-making processes in important sectors of infrastructure development. Large, centralised, capitalintensive greenfield projects offer decision-makers more scope for kickbacks, bureaucratic control and political prestige than decentralised, community-based services. They also offer more scope for private gain than the rehabilitation of existing infrastructure, or non-structural options such as reforestation programmes or demand-side management measures. Because of this bias, decision makers often favour large-scale public works projects even if the alternatives would make better economic sense and would have less harmful social and environmental impacts. Corruption – the misuse of public or private office for personal gain – extends beyond straightforward bribery. Planning processes in the infrastructure sector touch on important vested interests. Their outcomes affect the prestige of politicians, the budgets and personnel of bureaucrats, and the follow-up contracts of external consultants. Decision-makers are therefore under strong pressure to treat project options on the basis of factors other than their merits. Consultants who are commissioned to assess development options in a particular sector are usually aware that their clients have an interest in promoting new greenfield investments. They are equally aware that environmental impact assessments should not stop projects that enjoy political support. Even if they find that a project has unacceptable environmental impacts, they are under pressure to recommend mitigating measures for it, rather than promote less destructive alternative options. If consultants assess projects solely on their merits, they risk obtaining no future contracts. This causes what a World Bank report on involuntary resettlement in 1994 called ‘excessive appraisal optimism’. It is a form of corruption that distorts the planning process to the benefit of projects with large budgets, contracts and prestige – and often with massive social and environmental impacts. If strictly adhered to, this guideline would go a long way towards avoiding fraudulent practices in assessing and preparing options of infrastructure development. However, like other guidelines, it is not always implemented. Sunlight is the best disinfectant. Complete transparency is needed to discourage fraudulent practices in the process of assessing the needs and options of infrastructure development. Parliaments and civil society organisations must hold governments and financial institutions accountable for their decisions even during the early planning stages of infrastructure development. Peter Bosshard is Policy Director at the International Rivers Network. The Norwegian Authorities dismissed the case in 2003 through lack of evidence (see Norway country report). For a summary of the Veidekke/ Kaijuka case, see Development Today, 5 August 2002. Bandung Legal Aid Institute, Facts of the Violations of Human Rights and the Law: Corruption in the Jatigede Dam Project in Sumedang, West Java (Bandung: 2003). ‘Summary of RSI Staff Views Regarding the Problem of “Leakage” from World Bank Project Budgets’, undated. See A. Timothy Martin, ‘International Arbitration and Corruption’ in Transnational Dispute Management 1 (2004). Francisco Galiano, head of Paraguay’s General Accounting Office, as quoted in Ultima Hora, 3 September 2004. Testimony by Linda F. Powers before the Committee on Appropriations, Subcommittee on Foreign Operations, US House of Representatives, 31 January 1995. World Commission on Dams, Dams and Development (London: WCD, November 2000). For an elaboration of this principle in the context of dam building, see Michael H. Wiehen, ‘Transparency and Corruption Prevention on Building Large Dams’, paper for the World Commission on Dams (1999). World Bank, Guidelines: Selection and Employment of Consultants by World Bank Borrowers (Washington, DC: World Bank, 2004).